The LG G3 is now official, and, as every proper flagship should, it leaves little to desire. The company has put together a truly impressive package, and highlights like the G3's super-sharp, 1440 x 2560 (QHD) resolution display, its intriguing camera, and relatively compact form factor, are nothing to sneeze at. Truthfully, even in its current shape and form, the G3 is every bit a worthy flagship, and one that will surely give its rivals a run for their money. But for the insatiable techie out there, wanting more and more is always on the agenda. That's only normal in the grand scheme of things, and it's not hard to imagine that manufacturers take cue from customer feedback, especially in a cut throat industry like this one. Further still, considering the critical success of the G3 predecessor in the G2, but its relatively modest market share (compared to the iPhone and Galaxy S5), it honestly feels like now was as great an opportunity for LG as it is ever going to get to really set itself apart from the herd. Doing so, however, is a hard job, and one that necessarily has to do with even bigger investments on the side of the vendor. That means lower profits, sure, but that's usually how you steal away market share from the incumbents. Besides, we're not suggesting that LG should have incorporated all of the below features into the G3, though a combination would have surely helped it truly shine when put side-by-side with its main rivals. The LG G3 comes with a hearty, 3000 mAh cell, and though that's the exact same capacity of the G2's juicer, it has actually been further optimized according to LG. In their words, metal parts inside the unit itself have been replaced with graphite, which should help extend its charge. So why are we even asking for more? Well, color us dubious. Sure, we're not about to make a judgment call -- we don't have objective data just yet -- but even then we're a tad worried about the type of longevity the G3 will offer. That's mainly because it has to power a screen that is 1.8-times denser than rivals' 1080p displays, which naturally means more work for the Snapdragon 801 chipset, and thus, more battery drain. Not that we have any gripes with the Snapdragon 801 chip found on board the LG G3, but a whole bunch of people were hoping for the next-gen Snapdragon 805 to make an appearance. That would have indeed been a pretty major deal, especially seeing how the 805 is much more capable when it comes to handling demanding, 1440 x 2560 (QHD) displays. In short, the Adreno 420 GPU has seen a very sizable update, and the chipset as a whole is some 20% more power-efficient than the Snapdragon 800 according to Qualcomm. That said, LG may have a good excuse here. According to one source, the LG G3 doesn't sport the latest and greatest Snapdragon 805 since currently-available units lack an integrated LTE/HSPA modem for the time being. Word on that this could stay this way until the third quarter of the year. If that is indeed the case, it actually makes sense for LG to have pulled the trigger when they did and not wait out on Qualcomm. Time will tell. We keep coming back to this, it feels, but perhaps there's a good reason for that. Sure, LG did address concerns of cheap-feeling, cheap-lookign polycarbonate with the metallic, matte finish of the G3, but that's just a shortcut. Is this to remain an exclusive HTC territory? While still on the topic of body build, many sure would have welcomed a dust and water-proofed one, especially now that two of the G3's most ferocious rivals (Galaxy S5, Xperia Z2) boast such a feature. Sure, one could argue that waterproofing would come at the expense of the relatively compact physique of the G3, but that's not necessarily so. Just look at Japanese Sharp. With the two largest smartphone vendors on the planet having incorporated a fingerprint scanner into their latest flagships, it's safe to say that this specific niche of gizmos is trending right now. And for a good reason -- a fingerprint scanner offers a very decent degree of security, and, quality units are quite accurate for the most part. It doesn't seem like LG wants to be a part of that, however, and that's yet another feature that LG could have pursued in order to differentiate itself. Especially if it did it right, and went after a touch-based scanner (iPhone 5s), instead of the rather unreliable and somewhat unsuitable, swipe-type sensor found on the likes of the Galaxy S5 and HTC One max. My biggest concern in the battery. Pushing that many pixels scares the hell out of me. Why are you worried about the battery, the battery is no concern. It's replaceable like every phone should be! the battery is never "big enough" no matter what phone I've owned. A replaceable is the only way to go. The battery is a massive concern. It is going to need a lot of juice to power those pixels, and a spare battery simply isn't a solution. I'm not carrying another battery everywhere I go. Until we get some battery benchmarks, it is absolutely a valid risk to flag. Right, why have an article mentioning that the battery life could be improved even before the benchmarks are released. This article was released too soon or that should have been omitted. Are you suggesting that people carry a several batteries? It is replaceable right? Front, or at least side, facing speakers would've been nice too. Get over the plastic, it looks great and likely feels great as well. It doesn't need to be aluminum to be premium. not to mention that a majority of users end up with cases on their phones anyway. As much as I like the aluminum body of my M8 (which goes caseless half the time) I also like the plastic cases of HTCs previous flagship phones as well as the plastic used on the LG Spectrum 2. Those had a strong and premium feel to it and those phones were never in a case. Cell phones aren't automobiles. One you hold in your hand, the other holds you in place as it can go 100+ mph. nope, material was never an issue it's their effin design, fugly ugly design.... yes i'm talking to the whole samsung handsets! except the note 1-3... they are okay with me, but they are big for me... :) that's why they're called SAMESUNG! because from the cheapest to their flagship, they all look d same with cheap looking design. Wait, it's not really metal? No Adreno 420 to support 2K screen either. Disappointment. 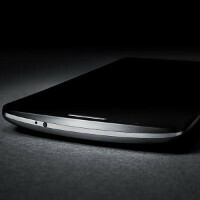 The real nex-gen phone will be the Note 3. This post is disappointingly retarded. Specially comparing the 805 to the 800 and 801. The 805 is only different in gpu performance. All those other things are really a non issue..
How spoiled can we possibly be as a society that we get on here and nit pick and absolutely amazing piece of technology? Do you remember what cell phones were like just 5 years ago? The G3 is absolutely amazing compared to just about any phone on the market. Really, all the flagship phones are amazing in their own way. How can you all complain about the smallest little things that are barely noticeable? Phone became better because we nitpicked about the screen, the battery, the software, the hardware, the camera, the features, the ease of use, the build materials and the protection against elements. 5 years from now, today's nitpicks will look equally useful, so quit acting as if we reached perfection, cause we haven't, and never will. Technology is organic, and organisms always evolve. This is not an issue of perfection. Perfection cannot be reached because perfection is different for each person. But we have reached a point with the improvements are very marginal. The difference between a chip 5 years ago an now is tremendous. The difference between the 801 and 805 is very marginal. You would not be able to notice much of a difference during normal use. Same goes with just about every other feature. I understand continuous improvement, but to complain about this phone or be disappointed seems childish to me. ahemm, no fingerprint no IP67, the phone is going to be slower than GS5 and Z2, battery a big concern, no usb 3, no fingerprint scanner, updated camera not another camera. well, it's a no for me and plus the silly design. the only thing I like is the screen to body ratio. I wished for 4 things it had in this launch but maybe in the next update: 1. Front double boom speakers( remove logo if possible). 2. Better cpu, ram. 3. Bigger battery. 4. front side design of G2 ( don't like the bottom different color) and back side design of G3. Careless for waterproof, and especially (please No finger sensor its a waste of space) or metal case since you will use a protection case any way.